Not intended for exterior use or where moisture is likely. 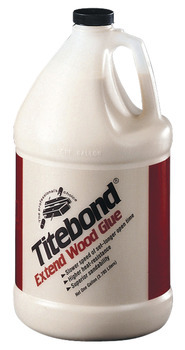 For exterior applications use Titebond II Premium Wood Glue. Freezing may not affect the function of the product but may cause it to thicken. Agitation should restore product to original form. It is recommended that Titbond Extend Wood Glue not be stored for extended periods at temperatures lower than 40°.